PSM Netball team wins the Grand Final! By Peninsula Sports Medicine Group|March 8, 2015|Community, Mornington Central Physiotherapy|Comments Off on PSM Netball team wins the Grand Final! 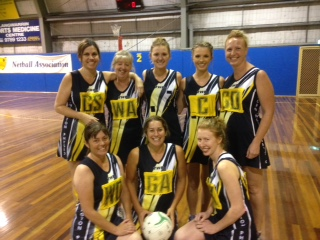 The PSMG Mornington Physio netball team was formed half way through this year while we were out for reception drinks. We finished the season 3rd on the ladder so had to play two finals to get into the Grand Final. We won both of the finals convincingly and the Grand FInal was last night. We won 28 – 23 against Karingal. Woohoo…. Congratulations to the following: Jo Housden, Danielle Watson, Teri Osborne, Tracey Snooks, Skye Work, Jess Smith, Eliza Jobling & Caitlyn Everitt who were the Premiership players. Tracey was awarded best on court as voted by the umpires – extremely well deserved. A huge thankyou to all our supported throughout the season & the huge crowd last night. A very big thankyou to Clinton from our Mornington Branch who is our major sponsor & supplied us with our uniforms. Very much appreciated.